I'm wearing one of my new favourite vintage pieces that I scored recently at Mesh - a gorgeous, kitten-soft cashmere sweater by Ballantyne knits in Scotland. 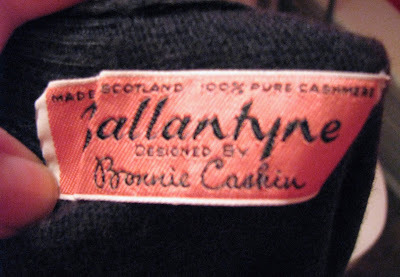 It was insanely inexpensive, came with the original tag, and aside from being manufactured by one of Scotland's top quality cashmere manufacturers, it was also designed by Bonnie Cashin, a pioneer in American sportswear design. 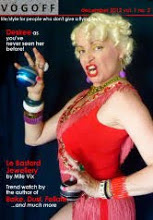 She is known for using luxurious materials in her designs such as leather, mohair, cashmere and tweed. Cashin designed knitwear for Ballantyne from 1964 - 1968, which would have been when this sweater was made. It is in mint condition, so I am assuming it was never worn. It's beautifully made, and incorporates two of my favourite colours into a retro-yet-modern shape. Definitely one of my best secondhand purchases. I love mixing eras in an outfit, and the 1960's sweater gets along perfectly well with my retail purchased pants from last spring, and my faux doc martens. This weekend, the Covent Garden Market plays host to The Wearable Art Sale, with 16 vendors offering scarves, jewellery, garments, knitwear, etc. Heather and I stopped by tonight to check it out. 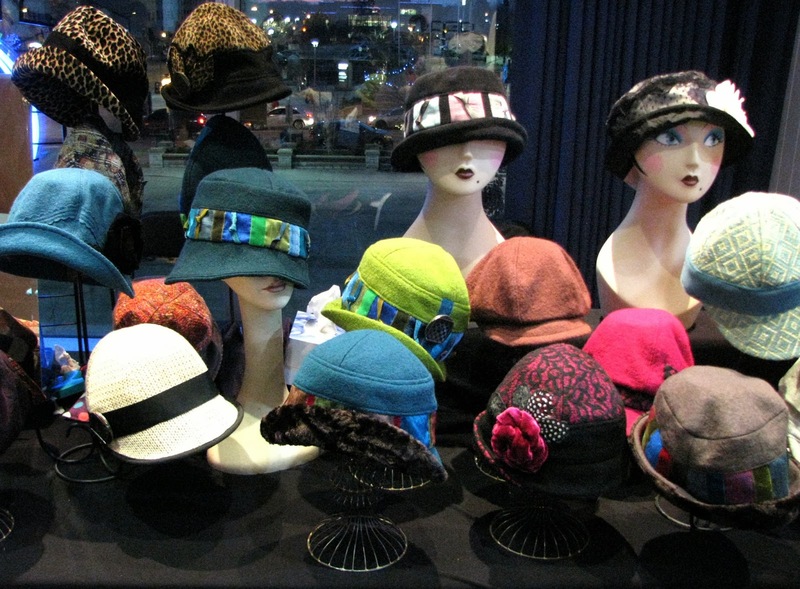 Canadian textile artist Patricia Richardson designs and sells hats under her label, Paddy Kelleher Designs. She makes her own patterns and designs and embellishes her hats with embroidery, beading and pleating. 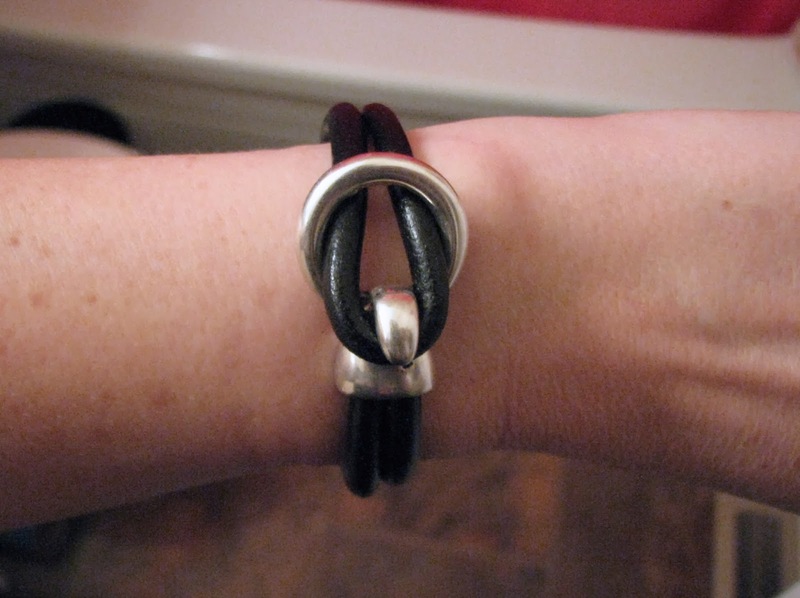 Norrie Duncan had some very cool leather and metal bracelets for sale at her booth, and I had a difficult time choosing just one. 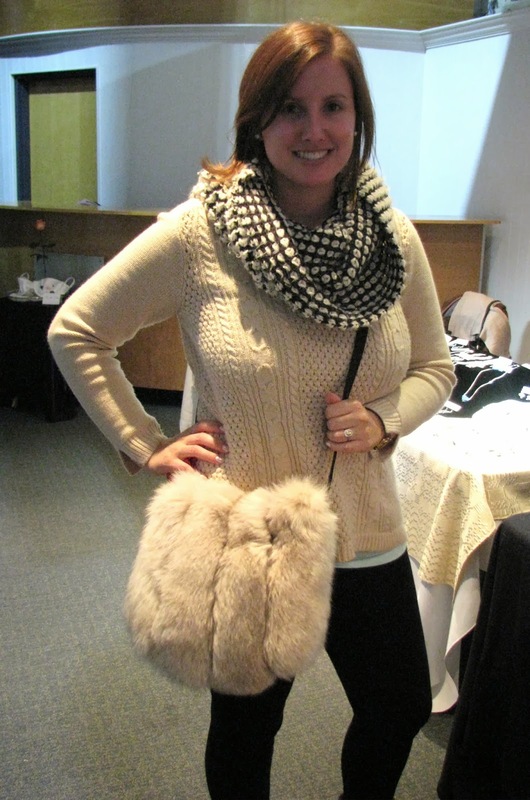 This woman was trying on a shoulder bag made of recycled fur from Eco Luxe Furs. The bags are gorgeous - there were three different styles, each from different types of fur. If I had one of these, I'd be petting it all the time! 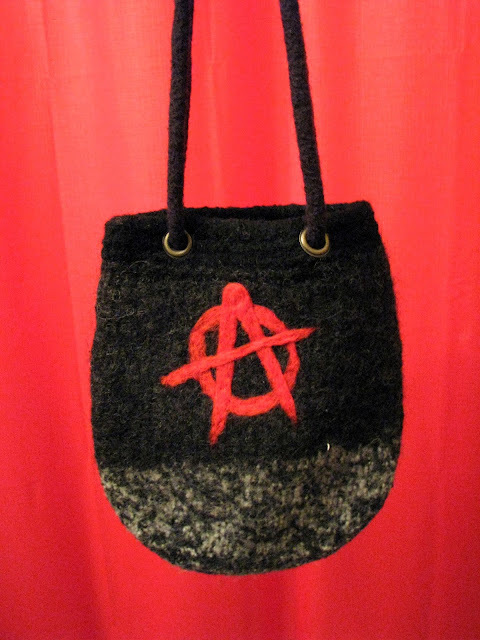 I admired the recycled fur bags, but ended up taking home this fun hand knit shoulder bag from Elan Knits. 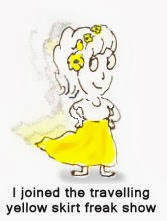 Ellen Mallet is the designer/creator, and is also the wardrobe mistress for Original Kids Theatre Company (and as it turned out, a follower of my blog). The bag is large enough to hold my camera and my wallet, which is the crucial test for me when it comes to purses. This sheared beaver jacket in my favourite colour combination is available from WrightByDesign. They also had some very cute fur-trimmed wool capes, scarves and hats. 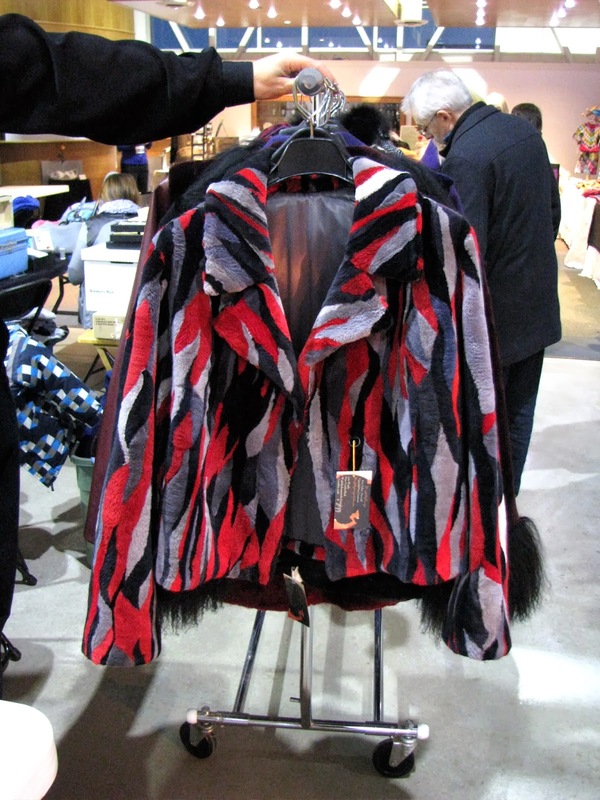 The Wearable Art Sale continues at Covent Garden Market on Saturday from 10 am - 6 pm, and Sunday, from 12 pm - 4 pm. O, I can just imagine how slinky soft your "new" sweater feels!!! There's nothing like cashmere, apparently! Perfect with the rough and tumble of your faux Docs! that's one beautiful sweater. And I love the anarchy bag. Hi, doll! 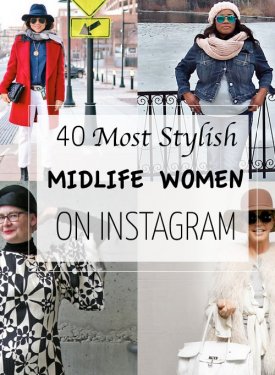 The grey & red purse is "killah"! Oh that cashmere sweater is just perfect on you, Shelley! You look so cool. SPECTACULAR cashmere sweater (Bonnie Cashin! AND in your colours!). So happy for you! The sweater is freakin' AMAZING!!! Your jumper is gorgeous, isn't the label fancy? I love the first pic of you - What are those glasses? i can recall you wearing them or i don't remember you wearing them? Nice sweater indeed, isn't great when you find something spectacular and cheap, best feeling in the world! Cool event, was it expensive? I love what you got yourself, the purse is fantastic ! We should get a few of those events soon in Montreal, X-mas is coming! There were some pretty expensive things at the show - the recycled fur bags were $100 - $300 and the multicoloured coat was $900, but my purse was only $20. Mother-daughter relationships can be so difficult at times, as I was reminded this weekend. We can only live our own lives and hope that they want to be part of it. 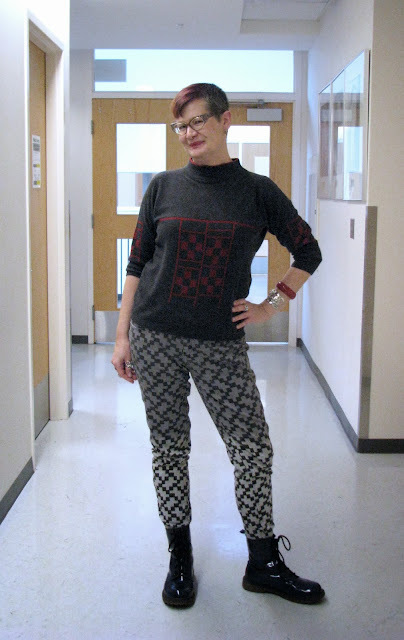 The cashmere sweater is perfection and love how you paired it with the patterned pants. And the hats! Be still my heart. I'm sure that I would not have been able to resist a purchase. However, the items that went home with you will surely shine as a part of an outfit by Shelley soon. I like the description "kitten soft." 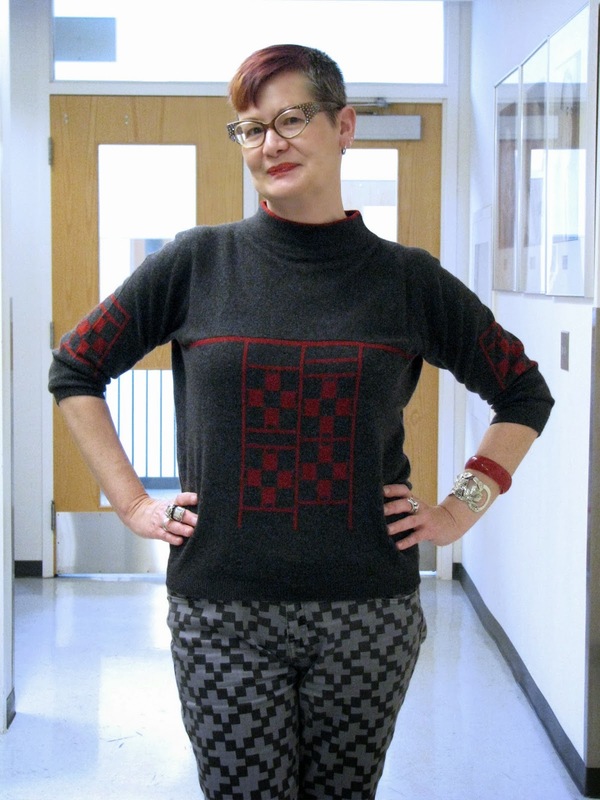 I have a piece of Scottish cashmere and it is just so soft - I adore your checker-board design sweater! love seeing all these great shopping venues you visit!